For the banana slug's earliest fans, rallying behind the mollusk was a mischievous gesture, a thumb in the eye of the status quo. 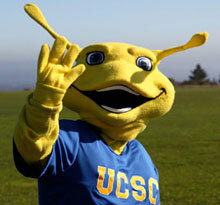 These days, 25 years after it became the campus's official mascot, the slug could not be more accepted and beloved. View our multimedia birthday celebration! Check out the results of UCSC's very first "hire me" student video contest, Hire Education!